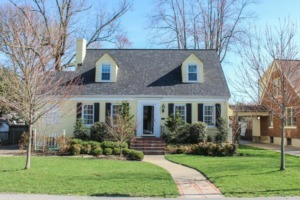 Stunning 4 bedroom/3 full bath Cape Cod in the heart of St. Matthews on one of the most desirable streets - fantastic curb appeal and lovely landscaping. Updated and move-in ready! Picture perfect with hardwoods throughout first and second floors. Spacious living and dining room on first level. Eat-in kitchen overlooking pristine backyard. Spacious first floor Master Suite - Master Bath features dual vanity and carrara marble as well as beautiful fixtures. Another full bath completes the first floor. Second level features three additional bedrooms and full bath. Finished basement which also features laundry, cedar closet and lots of storage. Two car garage and a carport. Backyard is fully fenced. This home is the perfect blend of old character and updates. Click to schedule your showing.